Home Posts Tagged "Hair Loss Treatment"
When considering getting a hair transplant, you might come across information about the procedure from several sources, and some of them will be myths. In order to avoid getting distracted with these myths and not getting the full truth, here are a few myths that you might read or hear about hair transplants. Hair transplantation is not costly when you look at the long term benefits of them. Once you get hair transplant done, it is permanent. In fact, having a hair transplant can be cheaper than taking medication for years in order to keep and regrow hair. Previously one can easily determine if someone had hair plugs fixed into their scalp. But, now with the new techniques, it is very difficult to tell if someone has gone through hair transplant procedure. The results of transplant are permanent and you can have the benefit of hair regrowth for the rest of your life. It is not true. Researches show that it is better to wait until a pattern develops. This helps doctors in determining which hair is more likely to be good candidates for transplant. Previously hair transplant was painful. But, now with the FUE or Follicular Unit Extraction method amazing results can be achieved without any cuts and stitches. It is not true. Firstly, you need a suitable hair donor area that has enough hair to be grafted. Secondly, a healthy scalp is essential. Can someone else’s hair be used in the process? No, in this procedure healthy hair is transplanted from one part of the scalp to the area that is losing hair. The hair continues to grow in its new place and you get a head full of hair. Hair transplantation is not reversible without going through a number of surgeries and why anyone would want to reverse it? Remove awesome looking hair? You don’t have to worry about losing hair anyway. They are there to stay. Transplants unlike your normal hair are not at all maintenance intensive. Treat them like your normal hair. Transplants don’t fall off. As it is a surgical procedure, the hair grafts are surgically fixed in to the scalp, as a result, they are permanent. To know more about hair transplant in Indore, feel free to contact us. What Causes Hair Thinning And What Are The Possible Treatments? There are a different number of things that can cause hair thinning and loss. Some include unhealthy eating habits, stress, depression, hormonal problems, drugs and some types of medical conditions. Poor as well as extreme hygiene can also be the causes. Many people wash their hair every single day but they fail to realize that this can dry hair out, making them to fall out. Some women also experience hair loss post delivery. There is no primary cause, and many men and women suffer from hair thinning due to different reasons. Some medicines are believed to cause hair thinning. Anti-depressants, birth control pills, medicines that are prescribed in treatment of gout, blood thinners and chemo and radio therapy treatments are known to cause hair fall. Vitamin A if consumed excessively can also cause hair loss. Men and women suffering from such side effects should first consult their doctors before stopping their medication, as it is never a wise decision to just stop taking medicines- especially when you have a medical condition. 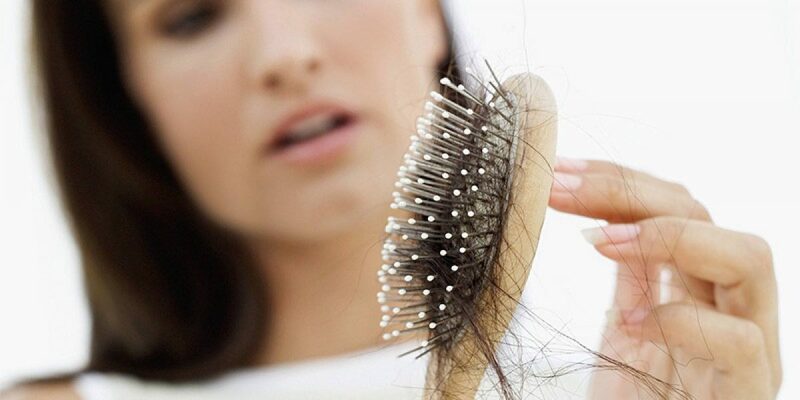 Some infections and illness can also cause hair thinning. Children can even lose hair due to fungal infections. Thankfully, it can be easily treated with anti-fungal medication. Some illnesses have underling side effects that cause hair fall. For example, lupus and diabetes are two popular diseases that can cause such issues. It is believed that hair fall and thinning may even be signs of illness, thus people suffering from hair loss should find out the root cause. Thankfully, treatments are available that can reduce or stop hair fall and prevent baldness. The medicines are available over the counter and with prescription as well. Some products are for women and some for men. Both medicines and serums are available. However, before trying any, one must consult a physician, like Dr. Meet’s Clinic. Depending on the reason or root cause for your hair loss problem, the doctors will prescribe you topical lotions, shampoos and conditioners and even medicines that you need to take orally. But, when considering consulting a doctor, it is important that you choose someone who is reliable, established and experienced. Then only you will be able to ensure great results for your hair loss problem and make those hair strands standing on your head. Dr. Meet’s Clinic is one of the renowned and reputed name when it comes to hair loss treatment. For consultation, give us a call now. Do you ever wonder how Bollywood celebs wear different hairstyles almost every day? How do they do it? Well, the secret to their quick hairstyle transformation are hair weaves. What are hair weaves? Extensions are one of the latest trends in today ’s beauty industry? Extensions are additions of either synthetic or human hair or a combination of both. They are either attached to the scalp or on to one’s natural hair through a number of techniques like Sewn in, woven and braided. They require adjusting or tightening as your hair grows in time. There are various techniques to weaving hair and one of the most popular ways is to sew in hair weaves to very small cornrows. In addition, here are other methods of hair weaving. Sewing in or tracking must be done by a professional stylist. Firstly, your natural hair is braided around your head in concentric circles, after which the expert will have to sew in weaves onto the braids. This process will be repeated a number of times until the extensions are firmly fixed. Extensions are bonded to the roots of your hair with a special liquid adhesive. In bonding weaves, your hair is separated into small parts before filling in your natural hair with adhesive near the scalp. Experts use the adhesive carefully and sparingly. Hair weaving provides a number of advantages like it gives your hair a more gorgeous and healthy look. Below are some of its benefits. For aging people, hair weaving provides a great substitute for thinning hair or hair loss. It has the ability to wear any texture without having it treated chemically and affecting your natural hair. Weaves add more volume to thinning hair, add to its length and change its texture. Wearing a weave is easy to maintain. It lets you style your hair quickly and doesn’t mess up after waking up in the mornings. As hair weaving can be used along with hair transplant surgery, it helps men and women who don’t wish to make public appearance until the successful hair transplants are done which generally takes 1-2 years. Hair weaving usually lasts 4-8 weeks before a retightening is required. Return to your doctor for some maintenance once your hair has grown about 2 inches. For hair weaving is Indore, feel free to contact Dr. Meet’s Clinic. Hair wig can be an important investment. This is because 100% real hair is in huge demand and by getting it from a reputed clinic, you can expect to get a good quality, natural looking hair. They can last up to a few years, if properly maintained. This means they are perfect for people who have hair loss problems. Unlike ready to wear synthetic wigs, real hair varieties are customized to your exact head size. Creating your human hair wig generally starts by taking a cast of your scalp and head. This is then converted into a custom-made wig base and the hair is added accordingly. The advantage is that your wig is very secure and safe; you are able to live an active lift without worrying about your wig accidentally dislodging. Definitely, a human hair wig is the closest you can get to your natural hair. The 100% real hair wigs respond like your own hair- they absorb moisture, colors can be added and removed. Other than realistic look, custom-made human hair wig provide features that ready-to-wear synthetic wigs don’t provide. In contrast to popular belief, customized human hair wigs are not generally supplied in a particularly cut style. They are generally supplied ‘uncut’ and the wearer chooses their desired style which is then cut by a specialist. As your hair are fully real, your options for styling are just like your natural hair. You can shampoo, go for swimming or do almost anything that you do with your natural hair. However, it is recommended to consult a professional from whom you got your hair wig to ensue you know the right usage and follow all the suggestions and guidelines. It is obvious that due to their very realistic appearance and extra security, human hair can usually be closest to your natural hair. This means no one will notice your hair wig, which will boost your confidence and self-esteem. Many wig wearers have never looked back. For more details about Hair Wig, feel free to contact Dr. Meet’s Clinic. We are just a phone call away. Hair Loss Treatment: When To See A Doctor? Every year millions of people are affected by hair loss problem. However, many people are clueless of what they should do for hair fall problem or how long they should let the problem to bother before they go to doctor for hair loss treatment. Part of the problem is that people try to fix issues on their own. Determining when to see a doctor about hair loss problem is important to ensure that you get the treatment you need to stop more hair from losing and regrow lost hair. Hair loss may look like a part of the aging process. But in reality, hair loss can indicate towards many different medical conditions. That is it is essential to see doctor for hair loss treatment as soon as you realize that you are experiencing loss of hair. There are many different tests that are done to check for different medical conditions to find out what exactly is causing the problem. The doctor will also go through your medical history to find out the answer to your hair loss problem. They will ask you questions to find out if the hair loss is due to depression, anxiety or stress. These are some of the common ways to find the cause of your hair loss problem and in turn an effective treatment solution. If you are someone who likes to try solving problems on your own, knowing when to consult a doctor for hair loss treatment is slightly more complicated. You may want to evaluate your lifestyle to find out if you are stressed about something or if you have any major illness or you recently had a surgery. If so, your hair loss problem would go away on its own, though it is a good idea to consult doctor about your problem. Don’t let your hair loss continue for too long. The longer the problem continues the more chances that the hair follicle may have damaged beyond repair. Once this condition occurs, there is nothing one can do to re-grow hair except for different surgical procedures. When to see a doctor for hair loss treatment is an important thing to think about. The best bet is to consult a doctor when you see that your hair line is receding or just becoming increasingly thin. Also, make sure you don’t stress about the problem or things could get worst. 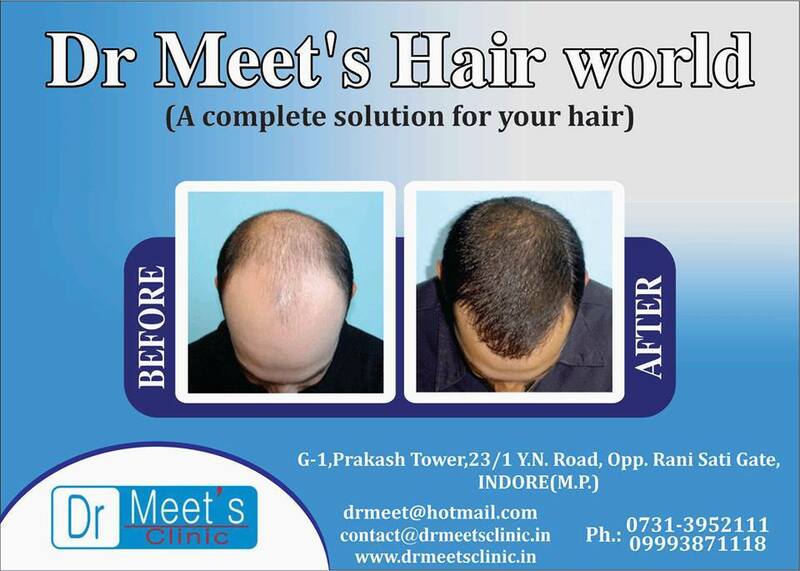 For hair loss treatment in Indore, feel free to contact Dr. Meet’s Clinic. Hair loss is one of the most common problems these days for both men and women. And this problem is no less than a nightmare for men and women because hair loss not just affects your overall appearance but also affects your confidence by making you look older. There are many reasons for hair loss and hectic lifestyle is one of the most common from them all. People don’t have time to look after their health, which proves to be one of the key causes of hair loss. It is said that hair is the most significant factor in determining one’s health condition. Hair loss not just happens due to stressful lifestyles and routines, but can also be a hereditary issue, or could occur due to scalp issues. Thankfully, today a number of hair loss treatments are available, as it is becoming a common issue day by day and recently the demand for such treatments has increased tremendously. Even markets are flooded with many hair loss products and solutions. But, when buying such products there is always some type of risk factor attached to them. In general, such treatments may contain ingredients that may cause skin allergies or result into side effects. Therefore, it is recommended to consult a hair specialist instead of going directly for any type of hair loss products. Doctor recommended hair loss treatment is a better option as they are prescribed as per individual hair loss problems. Usually, hair loss treatments recommended by doctors for men and women are different due to their hair growth. Besides, doctors do a thorough checkup of your hair and scalp and understand your medical history to reach to the root cause of your hair loss problem. Then depending on your age, problem and how quick you want results, the best hair loss treatment is suggested. In addition, in cases when patients want results really, fast doctors also suggest solutions like hair transplantation, hair weaving or natural hair wigs. The first thing doctors do when dealing with hair loss treatment is to try and figure out the possible reasons behind a patient’s hair loss problem and recommend treatments based on their condition and texture. This also assists to avoid side effects to a huge extent. The most common and effective hair loss treatment recommended by doctors is a proper diet with the right amount of vitamins, antioxidants, and minerals. This type of diet provides the essential nutrients and strength to the hair and thus prevents hair loss. For hair loss treatment feel free to contact Dr. Meet’s Clinic.